Tesla Inc. factory employees spent almost three times as many days off the job because of work-related injuries and illness in 2018 as the year before as the carmaker manufactured electric cars at scale for the first time. Read the full story, "Tesla factory injuries idled workers three times as much in 2018," on bloomberg.com. 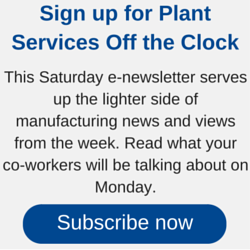 Don't miss Plant Services' March 26 webinar, "Optimize Your PM Strategy to Drive Maintenance Labor Efficiency."